Here’s a preview of some of what we can expect to see hitting our shores next Spring/Summer from Californian uber brand Urban Decay! 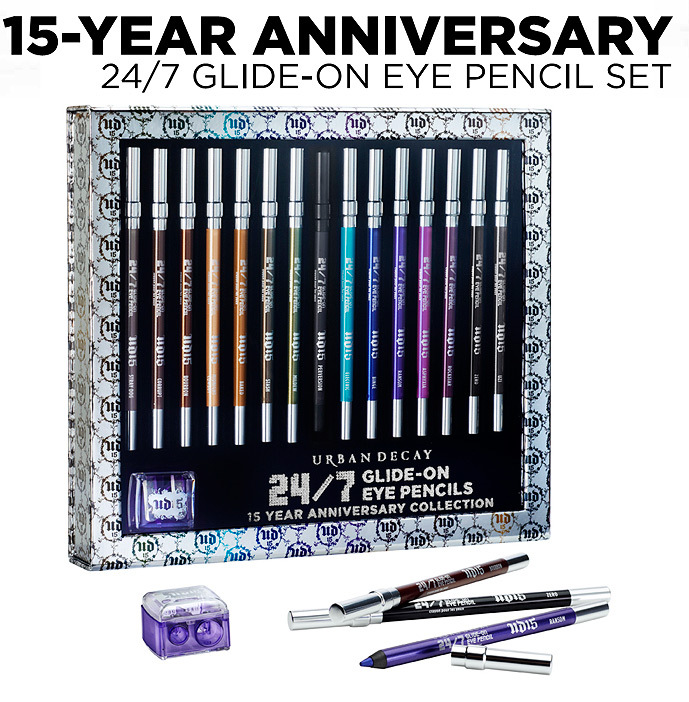 The 15 Year Anniversary Collection features 15 of Urban Decay’s 24/7 Glide-On Eye Pencils. Whilst Avon may have recently taken the shine off UD’s long-wear eyeliner pencil crown for me, there’s no denying that UD still do some of the most scintillating array of colours around. The full-sized liners (which ordinarily retail for £12 each) are packaged together like this for a limited time only and will set you back an eye watering £60. I know that mathematically, you’re getting a good deal… but £60 is £60 is £60 right? I’m thinking that this set will have limited appeal based on that alone, which is probably just aswell because there’s a very limited quantity available. If you’re new to Urban Decay 24/7 Liners, this would make a great investment… if you’re a collector, you’ll be all over it. If you’ve picked up most of the UD 24/7 shades already then you’ll probably want to double check that you wouldn’t be doubling up too much before purchasing. * connotes never-seen-before shades that are exclusive to this set. I think I’m most excited about the new blush launch! The Urban Decay Afterglow Glide-On Cheek Tints remind me (and I haven’t seen them in person yet, so I’m speculating) of a cross between Stila Convertible Color and those NARS Limited Edition Multiples we saw last Summer. They appear to be closer to gel than cream in consistency which is always good for Summer. Going by stock pictures alone, I’m in love with about 5 of these shades in the swatches above… are any of them calling to you? The Urban Decay Afterglow Glide-On Cheek Tints will retail in the UK at £18 (€28). The U.S. girls got these in Autumn, but we’ll be seeing them hit the counters soon! They claim non-sticky, sheer to medium coverage with a long-lasting finish. Available in 11 shades. 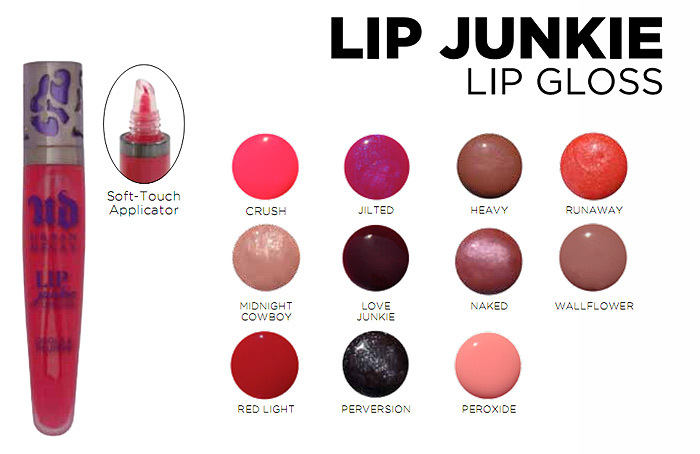 The Urban Decay Lip Junkie Lip Gloss will retail in the UK at £13 (€18). Packed with pearl powders and coconut oil, Urbanglow Cream Highlight promises to leave your skin with an ethereal glow. 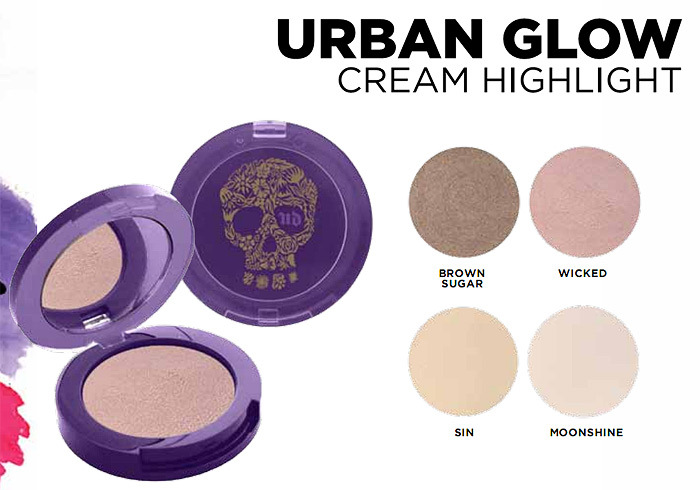 The Urban Decay Urbanglow Cream Highlight will retail in the UK at £18 (€28 ). I’ll try and get more info on exact UK release dates when they become available. What d’ya think… any must haves, any disappointments? Talk to me people!